I am attempting to read David Foster Wallace’s very large novel and write about the experience as I go. That is all. We’re back with Hal and we’re back with drugs, specifically that high-resin stuff. But Hal uses a one-hitter, as distinct from Erdedy’s bong. As was the case with Erdedy, however, there’s something going on other than the desire to get high. 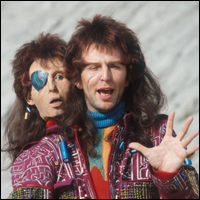 The Hungarian Jimmy Cliff was addicted to the ritual; Hal is “attached to the secrecy” that he can attain beneath the tunnels. American experience seems to suggest that people are virtually unlimited in their need to give themselves away, on various levels. Some just prefer to do it in secret. That’s right, Dave. It’s called writing fiction. Question: do you need to be interested in the mechanics and lore of marijuana to care about all this? Maybe the same question applies to tennis. Or will it be more like wrestling in the works of John Irving, an obsession of the author’s that you don’t need to share, but you need to accept as part of the cultural furniture? Or, hey, will it all turn out to be a metaphor? I’m guessing this may end up being significant somehow – “Total utilization of public resources = lack of publicly detectable waste.” – but I’ve no idea why or how. Waste? WASTE? Wasn’t that an acronym in Pynchon? DFW uses lots of abbreviations and/or acronyms. I’m rambling now. Anyone might think I was stoned. But seriously, this is running off in multiple directions, a bit like the tunnels under the ETA. I’ve also been seeking hints about how other readers/writers keep tabs on where they are in the action and how they communicate reference points to others. If one follows the advice of this live blog, it seems that it’s all about good, old-fashioned page numbers, which assumes there’s only one edition of the book with one pagination (maybe there is); but in any case, it isn’t much help if you’ve gone down the Kindle route. Should I be measuring out my reading in percentages? A number of blogs have suggested that something seriously important is going to happen at around the page 237 mark, which I suppose is somewhere in the vicinity of 22%. Bearing in mind I don’t really know what I’ll be looking for, will I need to read a bit more slowly there, just in case I miss something? Chapter headings, as I soon realised, aren’t much help, so I’ve had to impose numbers on them. And those chapters veer off into multiple sub-sections anyway. And then there are the footnotes; are they integral parts of the chapters, or separate entities? Ambassador Wallace, with these questions, you are really spoiling us. So, as I sit down to write this chapter and see it spooooling out in multiple directions ahead of me, I hope you’ll be accommodating if I take a break at some roughly-halfway point. OK, back to Hal’s secret spot for his solitary smokes. Apart from its practical benefits, his hideaway beneath the school is as much a vantage point from which he/we can observe/ruminate on the academic and sporting and personal and physical structures in which he operates. It’s like a big body, with its Lung Room, its Pump (heart?) Room, the tunnels serving as blood vessels or maybe nerves. That said, sometimes this book feels as if it has tunnels running off in all directions, half of them apparently containing dead ends. There’s one footnote in particular, number 21 (in the Troeltsch section) that redirects you to number 211, which in turn necessitates flicking through dozens of notes to things that haven’t happened yet and you start to realise the sheer immensity of the operation, that several of the notes alone have the potential to spawn a novel of more normal proportions and you feel humble and a little bit scared and you start to wonder why you started this bloody thing. You become aware of your own insignificance. Forgive me for another Douglas Adams reference – has anyone asked whether DFW was influenced by DNA, by the way? 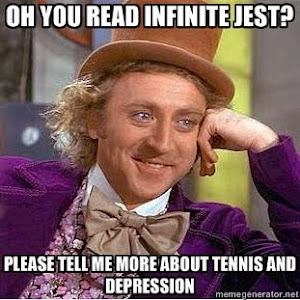 – is there a Hitchhiker’s Guide to Infinite Jest? – but it’s a bit like the Total Perspective Vortex. And, bloody hell, how come it took me so long to realise it, is Hal in fact Hamlet? An emotional basket case with a dead father whose role in the family and the state (ETA) is usurped by a relative. Duh. The title again. Is Orin Yorick? Maybe? Or is that Mario, with his big, weird skull? And suddenly we’re back with the attaché in the recliner and once again I wonder whether he’s been watching what we’ve been watching (Hal getting off his face, mostly) or watching us. Or is he watching the videos that Mario’s making? Whatever, it is, it’s pretty compelling stuff, as the attaché’s still watching it, now in a puddle of his own piss. And, since Mr Wallace suddenly elects to take us on a journey to another trademarked year – dairy products this time – that might be a good moment to take a rest. © Tim Footman 2012—. Simple theme. Powered by Blogger.